Aldar and HyperloopTT officials at the signing ceremony in Abu Dhabi. Hyperloop Transportation Technologies (HyperloopTT) has signed an historic agreement with Aldar Properties, a leading real estate developer in Abu Dhabi, to start construction of a Hyperloop system as well as HyperloopTT’s XO Square Innovation Center, and a Hyperloop Visitor Center at the Seih Al Sdeirah landbank in Abu Dhabi and in close proximity to the residential development Alghadeer.. The proposed construction site is located on the Abu Dhabi-Dubai border, close to the Expo 2020 site and Al Maktoum International Airport. However, any further development of the HyperloopTT system is subject to careful study and extensive regulatory review and approval. An innovative transportation and technology company, HyperloopTT said it is focused on realising a novel system that moves people and goods at unprecedented speeds safely, efficiently, and sustainably. Through the use of unique, patented technology and an advanced business model of lean collaboration, open innovation and integrated partnership, HyperloopTT is creating and licensing technologies. HyperloopTT said the construction of the line will be done in several phases starting within the 10-km allocation, with further development aimed at creating a commercial hyperloop network across the Emirates and beyond. Earlier this month, HyperloopTT began construction of the first full-scale passenger and freight prototype system in Toulouse, France, and expects delivery of the first passenger capsule later this year. The capsule will be assembled and optimised in Toulouse, France, prior to use in the emirates. Unveiling the UAE plans, Bibop Gresta, the chairman of HyperloopTT, said: "This agreement creates the basis for the first commercial hyperloop system in the world here in the Emirates, with the goal of eventually connecting Abu Dhabi to Al Ain, Dubai, and Riyadh, Saudi Arabia." “With regulatory support, we hope the first section will be operational in time for Expo 2020,” he noted. 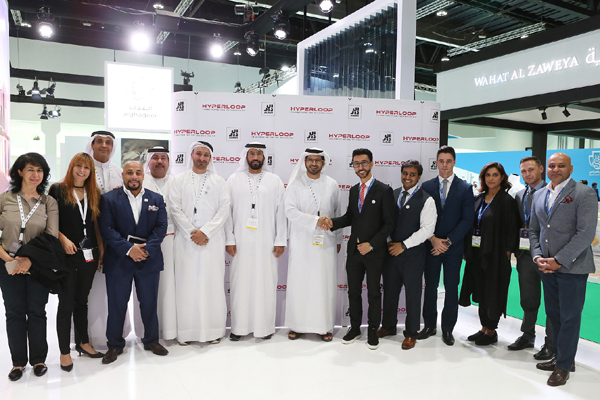 Aldar Properties CEO Talal Al Dhiyebi said: "We are delighted to be working with HyperloopTT as they look to bring one of the world’s most revolutionary transportation technologies to Abu Dhabi." "Alghadeer sits at such a strategic point within the UAE - close to major growth areas of both Abu Dhabi and Dubai, that it makes sense to pair it with rapid transport opportunities. We believe that Hyperloop technology can have a major positive impact on the lives of all of those living within our communities, and we look forward to this possibility becoming a reality," he added. Lauding the deal, HyperloopTT CEO Dirk Ahlborn stated that a forward-thinking nation like the UAE was ideal for building the most revolutionary, most efficient, and fastest transportation system in the world.